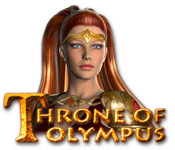 Throne of Olympus is rated 3.1 out of 5 by 33. 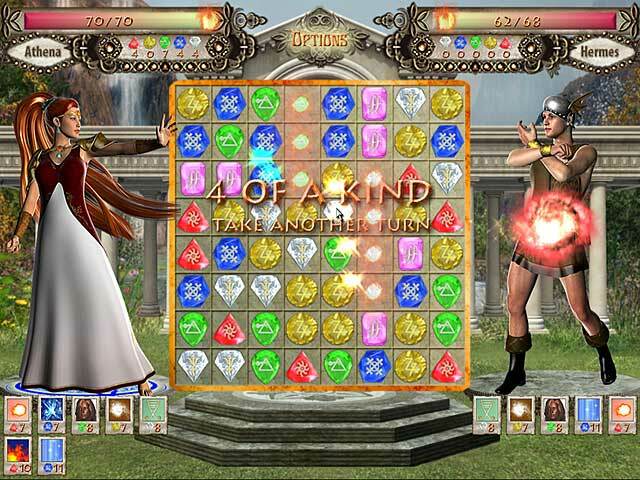 Rated 4 out of 5 by Altmoabit from beat the gods or the computer It is a very challenging game. Connect 3 or more and gain upgrades. shoot fireballs or ice blast at your opponent and get his hit points down. after every lever that is won there is an upgrade, I like that because you do not have to play a lot of levels to get an upgrade that you can immediately use in the next round. Graphics and music are ok and I would buy that game except when I play against Gods or as it is in this game against the computer, I feel at a disadvantage. just when I had the god almost beat he pulled of a lot of chain combos and was impossible to beat. other than that it is pretty good. Rated 3 out of 5 by mrm2006 from Challenge the gods to take your rightful place. So, Zeus has decided his daughter is going to take over his rule. The other gods disagree. In order to prove she's the right one, she has to beat the other gods. There are 12 gods to beat. Each has 3 minions. So, basically, for each "level" you have to beat 4 individuals/monsters/god/whatever. The first god is your brother who is on your side and agrees that you are the rightful successor to Zeus. So, he "practices" with you - basically a tutorial. It's worth it to play. You have "points". I guess they're like health or life points - as does your opponent. Often, your opponent will have more points than you. This is a match 3 game. You destroy your opponent by making matches of 3 or more gems. Matches of 4 or more and you get an extra turn. After every level, you have a choice of 2 bonuses, such as "fireball", "ice blade" and others. The bonuses each have different damage points to the opponent. Some also give you extra turns or refresh your damage. So, choose your bonuses wisely. They accrue but then they also get used up. For instance, I had to get a new fireball 2 or 3 times. Here's the thing. I never lost. Luck? Good match 3 choices? Or just an easy game? I kicked b___ on 6 gods and there 3 minions each. So, that's 24 victories. And, I'm not talking "close calls" either. I had a minimum of 40 or more of my 60 points remaining most of time. And, after beating 6 of the 12 gods and their minions, according to the "map" there were only 6 left. Does that mean I played half the game during the demo? While it's very strategic game play and I enjoy match 3 games, I found this less than challenging and not very entertaining. Also, the length of the game disturbed me. For these reasons, this game is not a purchase for me. I do, however, recommend that anyone who likes to fight the gods and their minions to give this demo a try. Happy Gaming! Rated 3 out of 5 by GrammyWinner from The Gods are Slow This game has great potential. The graphics and sparkle are wonderful. The Gods, Goddesses and minions are super works of art. However, with all the firing of killer weapons, the game is too slow for me. I hope in an update or something, the game can be sped up a bit. I am a huge fan of match games but sorrowfully, I will not buy this one. Rated 3 out of 5 by Screwy369 from OK Match / Fighting Game The same or similiar game board was used over and over. A lot seemed to depend on luck. At one point, the computer got to go like 7 turns in a row! Other times, I beat the opponent easily. It did get a little dull. More variation would help. Rated 3 out of 5 by DIBDAB5 from Hidden Object game the game was OK and personally i prefer building games but it was worth playing for 60 minutes might buy it but it will be with a coupon because i wouldn't pay full price for it. P.S i'm a cheap skate! Rated 3 out of 5 by sereneorchid from A little heavy on throwing fire bolts for me I appreciate the designers wanting to create a match 3 game with novelty and excitement. Here, you have the Greek gods battling for power via match 3 games. 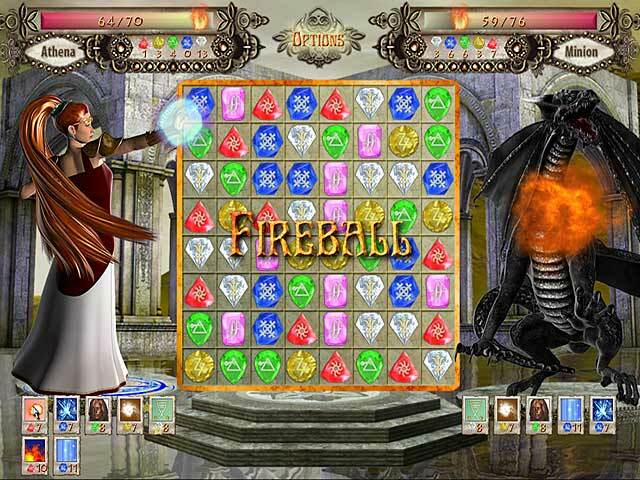 The different matching gems correlate with different spells, and as you make matches, you are increasing the strength of various spells, such as a fire bolt, freezing spell, or a bronzing spell, which you then use throughout the matching game to try to eliminate your opponent, who has similar fire power. After playing a few levels, and figuring out the value of the new spells, it became apparent that there was some strategy to be learned in being victorious in these contests of power. However, the game, curiously, provides no help section or advice on how to play the game. I will tell you that as you are offered different power upgrades between levels to take them, because they are cumulative; you won't lose the ones you had in the previous level. I think some people will find this game fascinating and enjoy the strategy of which gems to match first and which spells to power up first, and then figuring out, quickly, the most effective order in which to use the spells. This was just a little too much work for me. Visually, the graphics and animations are pretty good, but not outstanding, and in places the animations repeated over and over. Rated 3 out of 5 by Cornishwizard from Throne of Olympus Tried this game for the full hour by which time I was very bored. OK This is not the usual Match 3 game, but after a while, the game loses what started off as interesting. It's the games sameness that gets me. Not for me. Rated 2 out of 5 by Zellian from Interesting concept, subpar delivery The gameplay isn't fast paced enough to make the concept of this game work properly. Technically it's a match 3, but it really doesn't play like one. I was bored after playing for 10 minutes so I just uninstalled it. Rated 2 out of 5 by florrette from good idea, horrible game play i love the idea of this game - battle using match three. however the game play is so slow and and start stop. also when you make a high match, e.g. match 4 or 5 in a row, then the message shows up on the screen blocking your whole view of the board. make it faster and more modern and it will be much improved. Rated 2 out of 5 by anniemae1 from Not worth it I like Match 3 games, usually, but not this one. It was annoying to have fights between the player and opponent, and I didn't find it at all challenging, or relaxing. Rated 2 out of 5 by lucky424 from Thorn of Olympus...ouch! This game was like an old 1980's game. Meaning graphics were lame. Having to wait your turn when playing alone is boring! Although the storyline was cool. Everything else was a thorn in my side! Rated 2 out of 5 by Jeannewnc from Not worth buying IMHO Match 3 fans probably won't like this game since the matching is unchallenging for the most part. The boards don't change much at all from round to round. As a battle game, it's pretty good though. However, the computer-controlled opponents have the advantage. I played the free hour, but then uninstalled it. Rated 2 out of 5 by mrees1 from Dull Match Three I have played several of the "battle"type Match 3 games and this one falls short. The visuals are very good, but the game play is slow and uninteresting. Rated 1 out of 5 by chipind from i hate this game boring, boring, boring. don't waste your time unless you are a beginner. Help Athena defeat the other gods and take over the Throne of Olympus in this incredible Match 3 game!